Who built these ancient metal pipes deep inside a mountain cave? It's one of the great mysteries of the ancient world. Mt. Baigong in the Qinghai Province of China is crowned by a strange pyramid-like structure, full of caves that contain perfectly symmetrical, time-eaten metal pipes. They're inserted deep into the rock, and seem to feed into a nearby lake. The rusty tubes, ranging from needle-size to 16 inches in diameter, reach from deep inside the mountain to a saltwater lake 260 feet away. Many of the hollow pipes are uniform in size and seem to be placed purposefully. The ancient objects are embedded deep enough into the mountain wall and floor to preclude modern human handling. The inhospitable environment surrounding the mountain sees only the occasional nomad. Unless these wanderers developed secret advanced metallurgy skills, the pipes were not formed by human hands. Here you can see the mountain top, and a piece of one of the pipes. There is something deeply uncanny about finding rod-straight metal tubes in an ancient rock. The most recent researchers to examine the pipes believe that the metallic phenomenon are in fact fossilized tree root casts. 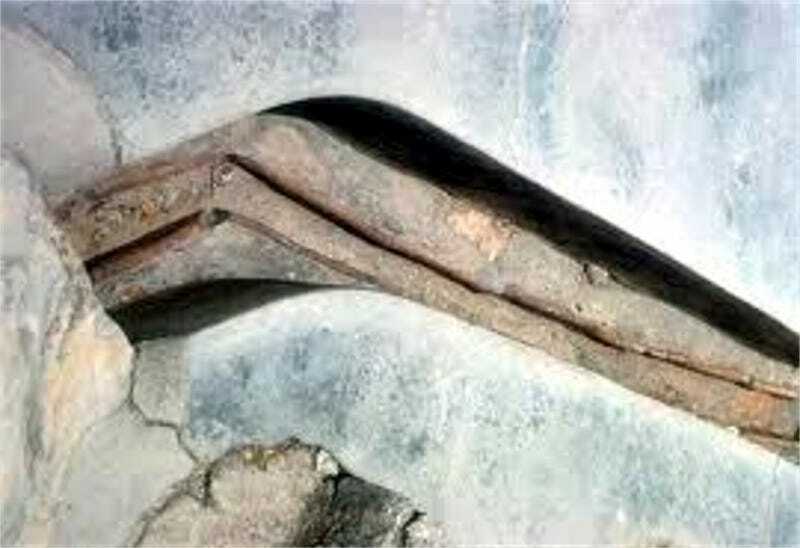 The rusted tubes being the result of tree roots that underwent the processes of pedogenesis (the process that forms soils) and diagenesis (transformation of soil into rock). Further experiments confirmed that the pipes contain organic plant material and even microscopic tree rings. Overflow from an extinct lake once carried these roots to where they stand now. Still pretty cool, even after a little debunkery. Read more about the Baigong pipes (and other cool places) at Atlas Obscura.